Dr. Rodolfo García-Flores has over 15 years experience in OR, particularly in mathematical programming, data mining, simulation, and multiagent systems. He joined CSIRO in 2006. As a research scientist, he has participated in different commercial projects, for example, in the development of software for minimisation of waste in dairy production, the design of beef supply chains, maximisation of productivity for a multi-national tyre manufacturer, and the analysis of environmental sensor network data. Before joining CSIRO, he was an associate professor in Mexico and a data analyst for a chemical company in Pudsey, England. Dr. Simon Dunstall leads the Decision Sciences program in CSIRO Data61. 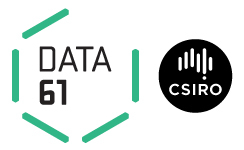 Data61's mission is to promote a flourishing national ecosystem of researchers, developers and innovators in digital technologies and data driven businesses. The Decision Sciences program has 100 staff members and a much larger network of collaborators, and has foci including social media analytics, information systems engineering, natural hazard risk modelling, optimisation, and finance and superannuation research. Simon is a researcher in analytics and optimisation. His recent work includes the developmentof infrastructure network planning systems and the development of methods for quantifying and managing the bushfire related risksposed by powerlines in Australia. In addition to his role at CSIRO, Simon is the current national president of the Australian Society for Operations Research (ASOR). Dr. David Marlow is a Science Team Leader and Discipline Leader-Optimisation within the Aerospace Capability Analysis branch of the Joint and Operational Analysis Division in DST Group. David has over 20 years of experience in Defence operational analysis and operations research with particular focus on aerospace applications. He has published in the fields of maritime surveillance modelling, aircraft fleet sizing and fleet management. His current interest is in applying simulation and optimisation techniques to aircraft fleet management and sustainment problems. David is also the current Vice-President of the Melbourne chapter of ASOR. David Cox is an Operations Research specialist with almost 30 years of experience solving military problems. He leads the Aerospace Mathematics Group in the DST Joint and Operations Analysis Division and is the Deputy Leader of the DST forward-looking Modelling Complex Warfighting Strategic Research Investment (SRI) program. David oversees DST research programs in the integration of new Australian Defence Force maritime surveillance and response aircraft, aircraft logistics, and analysis of new space situational awareness systems. David chairs the Challenging and Future Aerospace Operating Environments international technical cooperation panel that seeks to identify, develop and test new aerospace concepts and technologies ensuring that Australia, Canada, New Zealand USA, and UK preserve a technology advantage over adversaries. Previously David was the leader of the DST Operations Research Hub, whose charter was to improve Australian Defence Operations Research capabilities.